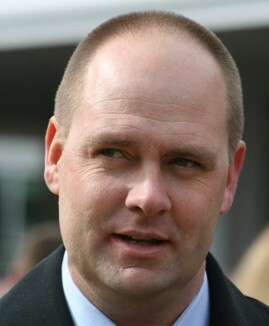 Trainer Doug O’Neill continued his 2009 success with 2-year-old first-time starters when #5 Necessary Evil established a new cushion track record in winning by 3-3/4 lengths. O’Neill used jockey Joel Rosario in this race, which had eight first time starters of the nine runners. Necessary Evil, who was bought for $160,000, showed three quick workouts and I was prepared to wager on her at 7-to-2 or better, but she ended up as the 9-to-5 favorite. Necessary Evil broke with the pack, then Rosario sent her to the lead. She was pursued down the backstretch and on the turn by #8 Laura’s Pleasure, ridden by Michael Baze. But that one ran out of gas at the quarter pole and nobody threathened thereafter. I bet $200 on second-time starter #9 Win for M’lou at 9/2 and $150 on #1 Ghost Shadow at 12/1.